Rembrandt belongs to the 'take-no-prisoners' school of painting as the ancient Greek Sybil in the lower left of the painting points to the crime being committed; the death of Vincent van Gogh at the hands of a jealous Rembrandt. Their mutual companion, Henri de Toulouse-Lautrec, looks on horrified as the Old Master wields his knife in the manner of Abraham in the same artist's 1635 "The Sacrifice of Isaac" now in the Hermitage Museum. 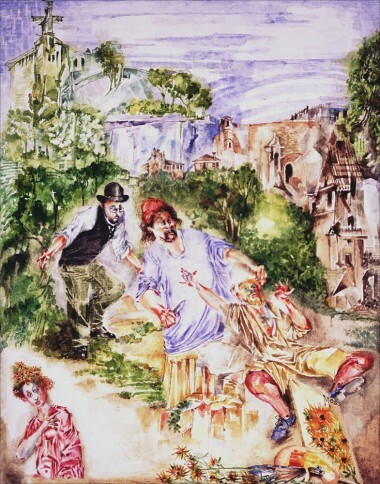 The scene takes place against a background of the landscape of the Principality of Monaco that the artist painted on site a few years previously and subsequently incorporated into this painting.